Sion Mills is a village to the south of Strabane in County Tyrone, Northern Ireland, on the River Mourne. In the 2001 Census it had a population of 2,050 people. It is a tree-lined industrial village and designated conservation area, particularly rich in architectural heritage. The village of Sion Mills was established by the Herdman family in 1835. The family operated a linen production mill in the village. 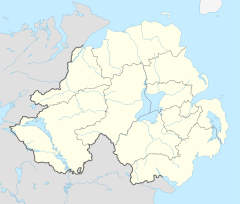 The name Sion comes from the townland of Seein, which lies to the south of the village. It is an anglicisation of an Irish placename: either Suidhe Fhinn (meaning "seat of Finn") or Sidheán (also spelt Síodhán and Sián, meaning "fairy mound"). The second part of the name is the English "mill". Sion Mills was laid out as a model linen village by the Herdman brothers, James, John and George. In 1835 they converted an old flour mill on the River Mourne into a flax spinning mill, and erected a bigger mill behind it in the 1850s. However, nearly everything in Sion Mills today was designed later, in the 1880s and 1890s, by James Herdman's son-in-law, the English architect William Frederick Unsworth. Sion House, a half timbered Elizabethan style mansion originally built in the early 1840s, was largely remodelled and expanded in the 1880s by Unsworth, around the same time as he was designing the first Shakespeare Memorial Theatre in Stratford-upon-Avon (this theatre was destroyed by a fire in 1926). More modest half timbered buildings include the gatehouse, the Recreation Hall and Old St. Saviour's Church. Unsworth based his design for the polychrome Anglican church, the Church of the Good Shepherd (1909), on a church in Pistoia in Tuscany. This church is built in an Italian neo-Romanesque style. By contrast, the modern Church of St Teresa (1963, by Patrick Haughey), the Catholic place of worship, is admirable for its severely plain lines – a long rectangle with a striking representation of the Last Supper on the slate facade. Oisín Kelly was the artist. A prominent local landlord and businessman in the area in the early 20th century was Brigadier General Ambrose St. Quentin Ricardo, C.M.G., C.B.E., D.S.O., Q.S.A. (1866–1923), a director of Herdman's Ltd.. Born at Gatcombe Park, his family's seat in Gloucestershire in Britain, he had married Elizabeth Alice ('Ella') Herdman in Thyet Myo in Burma (then a part of the Raj) in 1893 and had settled in Sion Mills around 1903. He was largely instrumental in having the Church of the Good Shepherd built in the village, construction beginning in 1909. He and his wife carried out many other improvements to the village, and they were amongst the founders of the Derry Feis. Brig. Gen. Ricardo was buried in the vestibule of the church upon his death in 1923. He was a great-grandson of the famous political economist David Ricardo (1772–1823). Sion Mills has a strong cricket tradition and was the venue for a celebrated moment in cricket history when the Irish team beat a West Indian side in July 1969. Sion Mills Cricket Club plays in the North West Senior League. Sion Mills railway station opened on 9 May 1852 and shut on 15 February 1965. The River Mourne was the reason that Herdman's Mill was built in Sion Mills, County Tyrone. It was founded in 1835 and is a large complex of now listed buildings, the most prominent of which was built in 1853 by William Henry Lynn of Lanyon, Lynn and Lanyon, Belfast. This is a very large and handsome five-storey mill built in Italianate style of grey ashlar stone quarried locally, with yellow brick extensions added in 1884 to 1900. There had been a series of corn mills on the site, (the earliest recorded in 1640), with the latest one rebuilt in 1828 which the three Herdman brothers from Belfast, and their partners, the Mulhollands, purchased from the Marquis of Abercorn, and this became part of the 1835 tow mill next to the river, now the three-storey "Old Mill". The immense water-power of the River Mourne provided 1000 water horsepower. The water-power and its history are still very much a feature of the Mill with the modern turbines, the newly developed river walks and picnic areas overlooking the huge weir and the 35 ft wide mill lade which flows on to run between the two main buildings of the Mill. There is also a complicated system of sluices and a suspension bridge ("the swinging bridge"). Mrs. Cecil Frances Alexander wrote her famous hymn, "All Things Bright and Beautiful", when she lived in Camus-juxta-Mourne Rectory overlooking the weir on the River Mourne at Sion Mills, in a Georgian house later owned by the Herdman family. The River Mourne is "the river running by" and "the purple headed mountain" is Meenashesk, a hill to the east of the village. ^ a b White, Laurence (28 August 2015). "John Mark Ambrose Herdman: Ulster diplomat served all over world in a distinguished career". Belfast Telegraph. Retrieved 2 September 2015. ^ "25 all out: The day Ireland bowled over the West Indies". The Times. 29 June 2003. ^ "Sion Mills station" (PDF). Railscot – Irish Railways. Retrieved 24 November 2007. ^ a b "Tyrone". BBC – Your Place and Mine. Retrieved 1 March 2009. Wikimedia Commons has media related to Sion Mills. This page was last edited on 22 April 2019, at 07:34 (UTC).